The Theracycle motor makes exercise easy. 88% would purchase a Theracycle again. 84% would recommend a Theracycle to a someone else with Parkinson’s. The motor makes the difference! 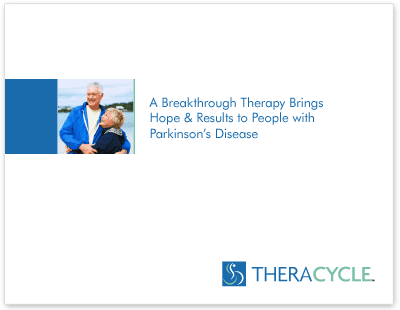 The Theracycle was specifically designed to help people with Parkinson’s disease. The Theracycle is designed to work with your body. While traditional exercise equipment requires a certain level of strength and endurance, the Theracycle’s unique motor allows every individual to get the exercise they need regardless of their strength and endurance levels on any given day. A clinical study done at the Cleveland Clinic in Ohio proved that individuals with Parkinson’s who participated in a forced-exercise regimen experienced significant improvement in their PD symptoms. The Theracycle allows people with Parkinson’s to follow the very same forced-exercise regimen as the study. Gerry B, a resident of New York and Florida, tells you why he cannot be without his Theracycle—which he uses to help control a rare form of Parkinson’s. John knows about the importance and challenges of getting sufficient exercise when living with Parkinson’s disease. Ideal for individuals who are wheelchair-bound, paraplegic, quadriplegic, or withlimited mobility. Ideal for individuals who are looking for a full-body workout that targets your arms, legs, and torso. All the features of the 200 but with additional adaptive functionality including a swivel seat and modified pedal options.